Surge in Immigration in 2014 and 2015? The reported increases in arrivals and foreign-born population growth in 2014 and 2015 are well within the bounds of normal annual fluctuations observed in Census Bureau survey data over the past 15 years. Any increases were the result of: (1) an increase in temporary admissions, mostly students and temporary workers and their families; and, (2) the arrival of immigrants (overwhelmingly those with legal status) who resided here in previous years, left for some period, and returned. The movement of the latter group, referred to here as “returning former immigrants,” is quantified here for the first time. The CIS projection of increased arrivals of undocumented residents in 2014 and 2015 is based on faulty assumptions. Legal immigrant arrivals accounted for all of the reported increase in total arrivals in 2014, and therefore undocumented immigration likely has remained largely unchanged. Most people are familiar with how immigrants become permanent residents (receive “green cards”). The relatively stable green line in Figure 1 below shows the number who became lawful permanent residents (LPRs) from 2001 to 2014. In addition to LPRs, the terms immigrant and foreign-born include two other sizeable groups: (1) undocumented residents; and (2) people admitted for temporary residence, such as students, temporary workers, and others. A third group, returning former immigrants, can also play an important role in increasing the number of arrivals and raising population growth. This report examines information about each of these components to assess their possible role in the increases projected by CIS. In addition, as discussed in a later section, the reported increases do not provide a statistical basis for projecting higher levels of undocumented immigration in 2014 and 2015. In fact, the so-called surge is based on a single half-year arrival number for 2014 from the American Community Survey (ACS) along with data for 2015 and 2016 from the much smaller and therefore less reliable Current Population Survey (CPS). Based on data shown in Figures 5 and 6 in the CIS report, the CPS is a poor predictor of annual population growth in the ACS (r = -.16). Nevertheless, the following discussion proceeds as if the reported increases actually occurred. Statistics derived from Figures 5 and 6 of the CIS report make it clear that the reported increases in arrivals, as well as foreign-born population growth in 2014 and 2015, were consistent with normal annual fluctuations over the past 15 years. Figure 1 shows the annual level of change in the foreign-born population from 2001 to 2016 as measured by the ACS and the CPS. As noted, the green line shows the annual number of immigrants admitted for permanent residence by the Department of Homeland Security (DHS) over the same period. The trend lines in Figure 1 were intentionally left to be “choppy,” rather than being smoothed by averaging, to demonstrate an important point: the measurement of foreign-born population growth using Census Bureau survey data varies widely from year to year. This occurs not just because of sampling variability but because immigration to and from the United States is a far more complex and dynamic process than is usually recognized. As Figure 1 shows, annual changes in the foreign-born population, as measured by the Census Bureau, have fluctuated considerably over the past 15 years. Clearly, the increases observed in the ACS in 2014, as well as the increases in the CPS in 2015, are in line with past variations in population change. However, even though recent population change appears to be consistent with previous patterns, it is still useful to examine possible demographic factors underlying the relatively higher numbers of foreign-born arrivals reported in 2014 and 2015. In addition to assessing current trends, there is another important reason for identifying the types of population involved in the reported upturn in total arrivals. CIS used the increased arrivals of total foreign-born as part of a ratio technique, described later, to argue that undocumented immigration increased significantly in 2014 and 2015. The validity of that technique depends on the kinds of populations that have contributed to the increases in total foreign-born arrivals. That issue is addressed in a later section. Figure 2 below shows estimated annual arrivals of the foreign-born population derived from the CIS report. According to CIS, in 2014 and 2015, the numbers increased by nearly 200,000 per year. As Figure 1 above shows, LPR admissions are fairly stable from year to year, so changes in that component could not have contributed very much to the increase in new arrivals. The Center for Migration Studies has identified two components of the population that are most likely to have generated the increases for 2014 and 2015 shown in Figure 2. The term “nonimmigrant residents” refers to noncitizens admitted to study, work or otherwise stay temporarily in the United States. As used here, it refers specifically to those who are likely to remain here long enough to be included in Census Bureau survey data. Examples include students, temporary workers, intracompany transferees, and the families of each group. In descriptions of immigrant population subgroups, they are usually referred to as nonimmigrants. Statistics for 2012 on the size of the resident nonimmigrant population reported by DHS (Baker, 2014) indicate that foreign students and certain kinds of temporary workers make up much of the nonimmigrant population. The DHS report stated that “Temporary workers and their families accounted for approximately 45 percent of the population, and students and their families accounted for another 40 percent.” The DHS estimates of the nonimmigrant population in 2012 were used in conjunction with annual DHS data by class of admission to make estimates of the total nonimmigrant population in 2013 and 2014. The results are shown in Table 1. 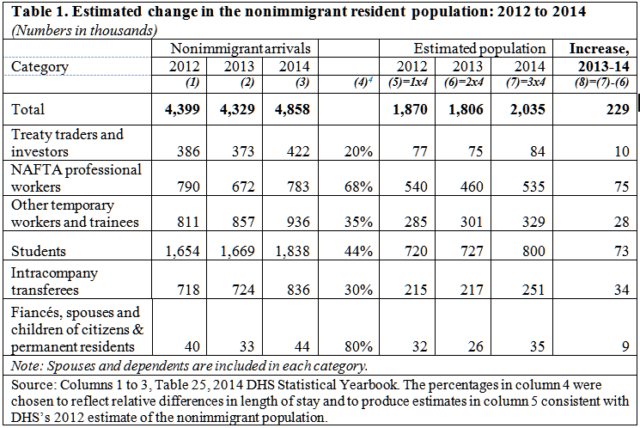 It is apparent from the figures shown in Table 1 that increased admissions of nonimmigrant residents in 2014 – those likely to be included in the ACS – could account for essentially all of CIS’s projected increase in arrivals in 2014 (see Figure 2). That does not indicate that permanent immigration has increased. Even though some of the temporary workers and students might eventually become permanent residents, they would be admitted within well-established numerical limits. Until then, they will remain temporary residents who are expected to depart at the end of their authorized period of admission. In other words, whatever their role in helping to create a surge, that role is temporary. It is likely that a portion of all types of immigrants – naturalized, LPRs, undocumented, and nonimmigrants – establish residence here and then move back and forth between the US and their home (or other) countries. Some emigrate permanently and some eventually end up in the United States. Economic forces probably play a role in that migration, but other reasons could also be involved. Unfortunately, no statistical information about the return to the United States of former immigrants is collected; in fact, to our knowledge, no estimates of the numbers involved have been made before now. Estimates of returning former immigrants were derived by analyzing data for the foreign-born population counted in the 2011, 2012, and 2013 ACS, for immigrants who arrived before 2010. An overview of the estimation procedure is provided here, and the results are shown below; details of the methodology will be included in a future article on this subject. Net emigration is usually computed by starting with an initial count, surviving that number to the next year (initial count minus deaths during the year), then comparing that expected population to the number counted in the next year. The shortfall, the difference between the expected population and the number counted in the next year, is the estimate of net emigration for the year. That procedure is illustrated below using data for foreign-born who entered before 2010, for all countries, from 2011 to 2012 (numbers in thousands, excludes Cuba). The calculation above is straightforward; however, when the same exercise is repeated for each individual country, apparent anomalies are observed. This can be illustrated by repeating the procedure above, except that we insert (unrounded) data for Colombia. Clearly, the count in 2012 for Colombia includes more people than were here in 2011, which indicates that many former immigrants from Colombia returned to the United States in 2011. The figure of 36,439 above includes returning former immigrants, but it could also be affected by sampling variability. So, to make the estimates more robust, we subtracted 15,027 (one standard error) from the 36,439 figure, producing an estimate of 21,412 as the number of returning former immigrants for Colombia. The total number of returning former immigrants for each year is the sum across all of the countries that, like Colombia, had estimated numbers of returning former immigrants (after subtracting one standard error from each country). Presumably, when former immigrants return after a year or more abroad and are counted in the ACS, most of them report their “year of entry” as their initial year of arrival (otherwise, we would not obtain the results described above for Colombia). However, some who return probably report “year of entry” as the year in which they returned. In the latter case, the returning former immigrants would cause an increase in the ACS data for the most recent year of arrival. Having derived these estimates, an important question remained: Were the returning former immigrants legal (noncitizens and naturalized) residents or were they undocumented residents? Prior to doing this analysis, the best guess was that a relatively high percentage would be returning legal residents because it would be easier for legal residents to return to the United States after some period abroad. As discussed in the next section, the answer to this question is important for evaluating CIS’s projected increase in undocumented arrivals in 2014 and 2015. Fortunately, data were available to derive estimates of returning former immigrants separately by legal status. The estimates could be done only for recent years because sufficiently detailed estimates of undocumented residents are not available before 2010. Table 2 below shows CMS’s preliminary estimates of the number of former immigrants that returned to the United States in 2011, 2012, and 2013 after more than a year abroad. The estimates are shown separately by legal status. The same procedures and assumptions were used to compute the estimates for each year. As anticipated, a high percentage of the returning former immigrants were legal residents. The estimates of returning former undocumented residents are relatively small and are subject to considerable sampling variation. The total number arriving increased by 76,000 from 2011 to 2012 and by 120,000 from 2012 to 2013. The figures in Table 2 support the proposition that as many as 100,000 of the increases in the foreign-born population reported by CIS in 2014 and 2015 could have been the result of increasing numbers of former (mostly legal) immigrants returning to the United States. Returning former immigrants, in addition to those estimated above, who reported 2014 as their year of arrival could have accounted for some of the increase in arrivals in the half-year ACS data used by CIS to project total arrivals in 2014. Before addressing CIS’s projections of undocumented immigrants, we can summarize the findings of this section. We have identified two streams of legal immigration which, taken together, account for essentially all of CIS’s reported increase in arrivals in 2014. Nonimmigrant residents increased by about 200,000 in 2014, with students and NAFTA professional workers accounting for much of the increase. The estimated number of returning former immigrants increased by roughly 100,000 per year from 2011 to 2013, and the numbers probably continued to increase with relatively strong economic growth in 2014 and 2015. An important aspect of the findings so far is that all of the increases in arrivals and foreign-born population occurred among components of the legal immigrant population. That finding is important for assessing CIS’s projected increase in arrivals of undocumented immigrants. The CIS study reported that 550,000 undocumented immigrants arrived annually in 2014 and 2015 compared to an average of 350,000 in 2012 and 2013. That assertion is not based on any new demographic information about undocumented immigrants. Rather, it is based on a flawed application of the ratio technique, as described below, and it was augmented in a way that likely duplicates some aspects of the undocumented population. The CIS projection of undocumented arrivals in 2014-2015 is based partly on a ratio technique that assumes, for each country, that the ratio of undocumented immigrants to total foreign-born who entered in 2012-2014 continues to apply to the total foreign-born population that entered in 2014-2015. To demonstrate the ratio technique, and to show the risk of obtaining erroneous results, consider the following information. Keep in mind that the numbers shown here are not exactly the ones used by CIS,  but these numbers illustrate the procedure used. Notice that the ratio has changed from .28 to .24 because the denominator, foreign-born entries, has added 200,000 entries. The original ratio is no longer applicable. However, following the logic of the CIS report, the “old” ratio of .28 would have been multiplied by 1,475,000 to estimate undocumented arrivals in 2014. In this example, the result would be erroneous – 413,000 undocumented arrivals would have been projected for 2014 rather than 360,000. This error accounts for most of CIS’s projected increase in undocumented arrivals in 2014 and 2015. To summarize this point: CIS does not present any new demographic evidence to show that undocumented immigration increased in 2014 or 2015, and the ratio technique that it used failed to take account of the fact that increased legal immigration was sufficient to account for all of the increase in foreign-born entries, at least in 2014. In simpler terms, if total foreign-born entries increased by 200,000 in 2014, and legal entries increased by 200,000, undocumented entries would necessarily have remained unchanged. CIS “further adjusted” its estimate of undocumented entries in 2014 and 2015 by adding an unspecified number of additional entries based on the economic crisis in Venezuela and Brazil, the surge in families from Central America, and increases in the number of visas issued abroad. Presumably, these undocumented entries would have been included in the 3.1 million foreign-born entries counted in the CPS in 2014-2015, and, technically, the estimate of undocumented entries produced by the ratio technique would have included them. The further adjustment appears to have been unwarranted. The statistical evidence provided in the CIS report does not support its contentions of a significant increase in immigration in 2014 and 2015 relative to earlier years. Current levels of arrivals are within the wide fluctuations experienced since 2000. The CIS study failed to fully explore the reasons for the recent increases in foreign-born arrivals. As a result, CIS’s reported recent increases in undocumented arrivals rest on faulty assumptions. This overview has shown that the reported increases in total arrivals in 2014 and 2015 are the result of increasing numbers of legal residents, primarily students, temporary workers, and returning former immigrants. An increase in these types of arrivals would not represent an increase in permanent new additions to the foreign-born population. The temporary workers and students will eventually leave, or some will adjust to LPR status (within the numerical limits). The returning former immigrants are not actually new additions. From 2000 to 2015, many millions of foreign-born migrants arrived and departed. They included LPRs, undocumented immigrants, nonimmigrants, refugees, and other groups. The net effect was to increase the total foreign-born population by 12 million (from 30 million to 42 million). Over that same period, more than 16 million LPRs were admitted. In other words, despite an enormous amount of migration to and from the country, some of it undocumented, the growth of the foreign-born population did not even keep pace with the numbers that were admitted for permanent residence. From that perspective, the recent uptick, involving predominately legal arrivals, hardly qualifies as a surge. It [rapid growth] is highly improbable based on: (1) the essentially unchanging patterns of apprehension data in the past few years; (2) the fact that the higher numbers in 2014 and 2015 are within the range of previous random fluctuations in the CPS data; (3) the likelihood that the numbers for recent years partially reflect the return migration of previous legal residents; and (4) the fact that at least one of the conditions that brought about the significant reductions in unauthorized immigration over the past 15 years – enhanced immigration enforcement – is still in place and in fact has been augmented in recent years. In this paper, the term “immigrant” refers to a person who has resided in the United States for at least one year. The phrase “reported increase” is used here to denote uncertainty about the data for 2014 and 2015 that formed the basis for CIS’s conclusions. 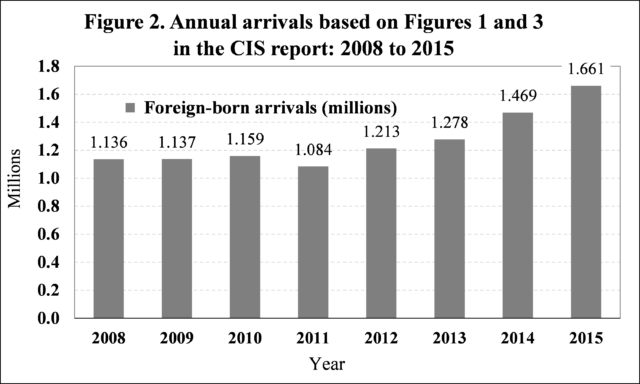 The numbers for 2008 to 2014 are from Figure 3 of the CIS report; the estimated number of arrivals in 2015 was computed by subtracting CIS’s estimate for 2014 from the figure of 3.13 million arrivals in 2014-2015 shown in CIS’s Figure 1. The percentages in column 4 were set at a level that would produce an estimated population in 2012 that agrees with DHS’s published estimates. Then, the same percentages were used to derive the estimates for 2013 and 2014. If 90% of the total nonimmigrant population shown in Table 1 for 2013 and 2014 was counted in the ACS, the result would have been an increase of 206,000 nonimmigrants in 2014 [2,035 x.9] – [1,806 x.9] = 206,000. Limiting the analysis for each year to the same entry cohort – foreign-born who entered before 2010 – eliminates the need to take account of differing numbers of arrivals each year. The only possible additions to this population from 2011 to 2013 are returning former immigrants, although, as discussed in this section, the estimates can be affected by sampling variation. The numbers used for foreign-born entries in 2013 and 2014 in this example are very close to the numbers shown in Figure 2. Source: Figure 6, Camarota (2016). Growth of the foreign-born population (which includes both legal and undocumented immigrants) was lower than the number admitted for permanent residence since 2000 because of emigration of the foreign-born population and because undocumented immigration declined after 2000 and has remained at a relatively low level in recent years. Baker, Bryan (2014). Estimates of the Size and Characteristics of the Resident Nonimmigrant Population in the United States: January 2012. Office of Immigration Statistics, U.S. Department of Homeland Security. https://www.dhs.gov/sites/default/files/publications/ois_ni_pe_2012.pdf. Camarota, Steven (2016). New Data: Immigration Surged in 2014 and 2015. Center for Immigration Studies. http://cis.org/New-Data-Immigration-Surged-in-2014-and-2015. Warren, Robert (2015). A New Upsurge in Unauthorized Immigration from Mexico not Likely. Center for Migration Studies. https://cmsny.org/publications/mexicanmigrationsurgenotlikely/.